Workers installing fiber optic cables on Walnut Street accidentally hit what is believed to be an underground tank with an unknown amount of petroleum product inside. 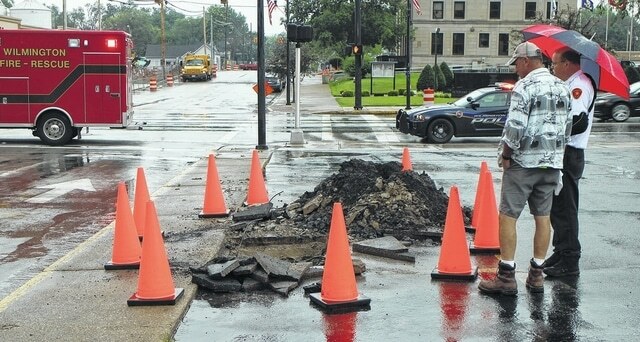 WILMINGTON — Workers installing fiber optic cables near the Clinton County Prosecutor’s Office Friday afternoon accidentally struck what is believed to be an underground tank containing an unknown amount of petroleum product. Lt. Brant Schmitt with the Wilmington Fire Department told the News Journal on scene the Ohio Environmental Protection Agency has been called in to investigate. Walnut Street will be shut down for at least the next few hours between Locust Street and Main Street, Schmitt said. Schmitt told the News Journal the area will most likely have to be excavated to remove the tank and clear any contaminated soil.